I have been sort of immersing myself in puzzles! I wish I could admit to doing a lot of baking, cooking, or cleaning >>> but that’s not the case. I set up a puzzle-making table in our family room >>> and have been going rather crazy. Actually, I multi-task: I watch the old, black and white movies that I tape while I make my puzzles, something I used to do while cross-stitching. I have several favorite puzzle-makers, Charles Wysocki is my favorite artist, followed by other artists like Jane Wooster. A friend of mine came over last week, took a look at my puzzle table, and remarked that I probably enjoyed puzzles because they are so relaxing. Hmm… I don’t think of my life as stressful in any way but I guess the puzzles are relaxing, however not when I am searching around on the floor for pieces I have lost. Getting back to my friend >>> She works at a school here in town and finds the job somewhat stressful. She told me that she has taken up coloring, which helps her unwind after particularly difficult days. I thought she meant that she has found more difficult children’s coloring books for herself. Nope, she told me they actually make coloring books intended for adults now. Hmm… I found that interesting. I remember really enjoying coloring with my children years ago, so of course as soon as I got home from lunch I went online to look at adult coloring books. Wow! There sure must be a lot of people with a whole lot of stress out there! It looks like they have adult coloring books for every reason (dogs, cats, flowers, etc.) and season (Christmas, Halloween, etc.)! This got me thinking: Are there any non-reading activities that keep you from reading your favorite Cozy Mystery books during your fun time? I know we recently talked about the types of non-mystery books we find ourselves reading, but this time I’d like to find out about other activities you do for relaxation/fun >>> and I don’t mean household chores! Please post a comment if you do. Thank you! I love the adult coloring books and they are just another way to be creative and relax!! I also like to color while I have an old movie playing in the background! You must get one and also a set of good colored pencils and markers. 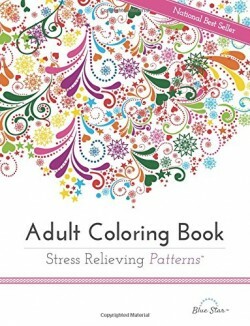 Kitty D, when I saw what the adult coloring books looked like, I told my husband that they seem like a great way to go. When I finish a puzzle, I break it up and put it back in the box. But when you finish one of these pages, they are beautiful and last forever! Danna and company: actually, if you really like a puzzle and want to keep working it-you’re going about it the right way! (and there isn’t a wrong way-so you win)! But if, say, you did a puzzle that you liked but weren’t sure you’d do it again, glue it to a board with a stickmount that you can get at craft stores. Or use a glue sheet on the back of the puzzle. When all of your pieces adhere to it, get it mounted and framed and it makes a really nice picture to hang. I like Charles Wysocki’s art work too but as I’m training to be a tax pro-I don’t have a lot of free time. I am also a caregiver for a very demanding 89 year old father, so again. Not much free time! I actually knit or crochet for downtime, non-reading fun! Very relaxing for me and I can claim I’ve finished something. I also do Paint-by-number works and when I have time-those turn out fun and can be framed, mounted and hung. They are very nice when they are done and you’ll have a piece of hangable art that is fun and relaxing when you’re done. All my best to you readers! Rob, thanks for the finished-puzzles ideas! Also, good luck on the income tax preparation studies! Danna: Husbands aren’t the only ones that like to point out logic disorders! Fathers and brothers do as well! That is just one reason why I won’t have one when Dad passes! You can all do better than I do with that. i have been cross stitching Christmas towels for the staff in my sisters school office. Don’t know how to post a picture on the blog, I will post on comments on Facebook. Rita, I can’t believe I have almost stopped doing my cross stitching! I usually love to sit and stitch, but for some reason, my puzzle table keeps calling me! You sound like a super neat sister! How nice of you to stitch Christmas towels for your sister’s school office staff! Tiffani, our Sprite was a little Bichon Frise who suffered terribly from allergies. (My husband and I had to give her allergy shots at home.) I don’t mean to pry, but does your little West Highland White Terrier have allergies. My vet told me that little white dogs suffer the most from allergies, and I have always wondered about that. Aww Bichons are so cute! Yes, she has allergies! We have to give her allergy medicine and she has to have a bath weekly. Her allergies don’t usually last all year long. It’s usually during the summer and spring months. So we believe its just seasonal allergies. Tiffani, baths once a week and daily allergy medicine take me back! Our Sprite had severe allergies all year long. She was even allergic to grass, which was a pretty bad thing for a dog to be allergic to.. I have two fabulous rescue dogs. A chihuahua and a beagle/bassett. Playing with them and walking with them in the woods is one of the best parts of my day. We also have two rescue cats. Miss Agatha will actually walk with us wherever we go. However because we live in bear country I only allow her to play in the yard with us. The other cat keeps watch over all of us. At night I get to combine my cozy reads with my cozy pups and cats as we all snuggle on the couch. I have a perfect life. Anne, reading your comment made me miss my dog! It does sound like you have a perfect life! Anne: sounds like you have it made, Lady! I have a rescue puppy that is a long haired Daschound named Max (my dad’s name for him). He was named Harley but Dad didn’t like that name. I named the last dog we had so it was his turn. I take Max for about 3-4 short walks a day, (or more if his belly is acting up). So we get some night time walking in. Barking at people and other dogs and cats. Got to keep the riff raff out, you know. I don’t know what a dog considers riff raff! Squirrels and skunks, Muskrats, I guess. My Max likes to curl up with me when I knit, read and watch tv. It sounds like you have some really nice companions too! I love puzzles as well and there is always one set up on my coffee table to do while I watch TV. I am a passionate quilter and gardener so that has been keeping me from starting The House of Riverton which I’ve had from the library for several days. Although not a cozy mystery, supposed to be a good read. Rebecca, I thought about taking up gardening, but as I mentioned in a previous comment, I don’t enjoy sweating. (And here in San Antonio, gardening would require doing that!) Quilting and gardening sound like the best of indoor and outdoor pastimes. I make hand made greeting cards and gift packaging with cardstock, rubber stamps and ink, this also often involves coloring the stamped “picture” with markers, colored pencils or ink. I have been doing this for about 14 years now and I find it very relaxing plus you end up with cards to send to people or give out as gifts. Laura B, what a delightful way to not only have fun relaxing, but also for making handmade gifts for friends/family. Hi. I do several things to unwind, relax, and de stress. Like you, I love jigsaw puzzles. In fact, the one in your post looks awfully familiar. (Side question….do you also have a pile of puzzles waiting to be”done?”). I no longer do cross stitch, but I do lots of needlepoint. In these days of heady technology, I do Pinterest. And although it is not an indoor activity, I take long rambles with my pooch. 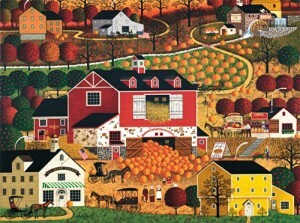 Mary G, I absolutely love the Charles Wysocki jigsaw puzzles. They are by far my favorite. I like his style, his subject matter, and also that he never does a white polar bear, lost in a snow blizzard, while looking for a white rabbit with a white cotton tail type of painting. P.S. I’d love to have my pooch with whom I could take long rambles! I could easily spend more time reading, especially when I think about all the time I waste playing Spider Solitaire, Freecell, and reading other people’s posts on Facebook. Reading gives me so much joy and calms me down, but I also spend a lot of my time going out to lunch and to the movies with friends; going out to dinner with my husband and another couple; volunteering for the police department; and getting together twice a month with two book club groups. My husband and I also travel–in two weeks we’re leaving on a trip to Yellowstone and the Black Hills, then visiting an old friend and her husband. I try to read while my husband is driving! A long time ago I did counted cross stitch, then taught my mother, who picked up where I left off and far surpassed me, making some of the most beautiful pieces I’ve ever seen. I did other crafts, too; now I look at craft ideas, make copies of the patterns, sometimes buy the material, then never get around to making the projects. I’m a great procrastinator! I wouldn’t call your life boring, Patti! You sound awfully busy, to me – and to echo somebody earlier – some of it sounds awfully familiar! Lol! Patti, my goodness! You are describing a really wonderful life >>> far from “terribly boring”! Shame on me, you mentioned some activities that I take for granted, yet you are so right! While writing this entry, I never even thought about activities like lunching with friends and/or family! Thank you! Amy, as much as I enjoy my cross-stitching, I seem to have abandoned it these past months. I am working on a 12-month calendar, using Mill Hill beads in every stitch >>> but for some reason I haven’t finished up the last month. These puzzles have gotten under my skin! Mary, I hope the coloring books for adults help you during your “fun & relaxation” time >>> although after reading your comment, it doesn’t sound like you have a lot of time that you aren’t on the go! Also, good luck with your recuperation time. Coloring sounds fun but I have wanted to try Zentangle. Reading is of course my primary relaxation. OH YEAH!!! And its all YOUR fault LOL! I spent some time reading back through the archives of this blog — and at some point came across reference to… Majong Solitaire? On the Kindle??? My newest obsession!!! Its sooooo addictive!!! Margaret, that’s right, I talked about my MahJong and Sudoku Kindle games in the past. They are so addictive! i knit and crochet. I spin my own yarn to feed the knitting/crochet habit. I also weave. Peggy, it sounds like your fun and relaxation activities are a lot more productive than mine! You could star in your own cozy series! Have you read the Della Wright series by Carol Ann Martin? ****From Amazon: Della Wright comes to the Blue Ridge Mountains to purchase a weaving studio. She offers weaving workshops and gets to know the small towns’ colorful characters. Della solves murders. Features weaving tips! Walk! I walk every day, at least once. Sometimes by the lake. Sometimes down the hill and back. Of course, many of my walks are spent plotting my next mystery. Kate, I wish I looked at my walking as a fun and relaxing activity. I take my walking shoes off as soon as I hit the 10,000th step on my FitBit >>> that’s how much I enjoy it! WordFeud is a hyped up version of Scrabble (with real people not bots). Nancy, WordFeud sounds like it might be fun. My cellphone is one of the antique models that flips open, so I doubt it’s in my future! My husband finally got a phone with all the bells and whistles, but I’m still holding out. When not reading cozy mysteries, I’m on the computer doing genealogy. It is work, but once you’re hooked …. The computer and internet does make it soooo much easier. I love jigsaw puzzles. I used to own close to 200 Charles Wysocki and several Jane Wooster. Decided to downsize and donated them to the Altenheim, a Senior Living Community, where two aunts, a grandmother, and a cousin lived. I have switched to Big Jig, an online jigsaw found on Lena Games web site. Great pictures and no storage problems. My BFF owns several of the adult coloring books. Blue, I have to ask — do you live somewhere near/outside of Chicago? My grandmother lived in a place called Altenheim outside Chicago many years ago. I realize it’s a German word for Olden Home (I think), so maybe there are a lot of them, but it’s the only time I’ve ever heard that term. And I recently discovered adult coloring books, too. When my son was little, I would color with him and found it so relaxing. Of course, I wanted to color a lot longer than he did! Altenheim seems to be the name of a number of residences. My husband’s cousin lives in an Altenheim community in Indianapolis. Blue, what a lovely place to donate your puzzles. Another nice place to donate them is to hospices. I remember when my dad was in a hospice >>> they had a puzzle going all of the time in the family conference/waiting room. If I don’t have a book or my kindle in front of me, I’ve got knitting needles or an embroidery hoop. I actually do find both activities very relaxing. Seems funny not to have something in my hands, even when watching tv. Deb B, I totally agree about watching TV while doing something with one’s hands. I remember my husband’s family thinking I was a little over-active because I could never just sit there and watch TV. I was always cross-stitching. I am a puzzle person as well….morning paper has 5 different puzzles that I have to work every morning or my brain feels unchallenged…..two crosswords (one the NY Times), cryptoquiz, jumble and Sudoku……when I have worked those five, I feel my brain is fully engaged for the day. I also have puzzle books with variety of puzzles that I enjoy. However I also rescue dogs…..used to be only dachshunds but somehow I have wound up with Chihuahuas, mutts, mixes, and such……some I place with others, some we adopt in our family…..Of course I read. Since I was a child, I have always read at night to wind down before sleep….back then with a flashlight under the cover even…..and still have to have my Kindle at bedside to pick up when ready to relax. I also love to travel, in my little RV Chinook, with my kids, and friends, and even alone….because I literally broke my neck a year ago, I had to delay some trips but went to Cuba in May with good friend and going to Italy end of September with both daughters….at 80 I am now more careful but am determined to live every minute of every day!!! When Mom was 80, we took her to NYC and Washington DC. When she was 85, we took her to Florida and Georgia. Your heads up on movies is so appreciated by me, and I am learning more about cozy mysteries all the time…..not knowledgeable like the majority of your readers but working on it. Thanks again for your hard work on research! Barb, can I ask what newspaper has so many word games? I’d love to learn how to do those – I’m middle-aged and I think it will help to keep my mind nimble as I get older. Barb2, yikes! I’m sure I could never finish a NY Times crossword puzzle! I’ve tried to do a few of them, but to no avail. However, I do enjoy Sudoku and word jumbles >>> but only if the jumbles are super easy! Love your live life to the fullest attitude! My first thought was, “I go to the library and pick up some more!” I actually do take some breaks from cozies. I do adult coloring, play candy crush, play with my kids and bake. Ana, I just looked up Candy Crush. Years ago it was called Bejeweled. I used to play that at my computer >>> especially the holiday editions. I sing in my church choir, volunteer at my church’s food pantry, and knit — mostly Barbie clothes. I adopt a couple of kids off the Salvation Army Angel Tree every year, and I always try to get a girl who wants Barbie, so knitting various wardrobe items keeps me busy. I also like to watch DVDs — I’m a scifi geek, so I watch a lot of shows like the various iterations of Star Trek or Stargate SG-1, Babylon 5, and other, similar shows. Lately, I’ve also been spending a lot of time watching Great Danes on the Service Dog Project live cameras on explore.org. What a coincidence! I’m rewatching DS9 right now. I’m just finishing up season 5. It’s my favorite of all the Star Trek offspring. LOVE “Firefly” — shiny! I used to quilt, but a stroke that affected my right hand stopped that. Now I try new recipes, watch British Television shows, do Facebook, and read. Also love to eat out with my husband, play cards with friends, and visit our two young granddaughters. Gail, I’m sorry to hear about your stroke. I know how debilitating they can be. It sounds like, other than quilting, you haven’t let it interfere with your life. You sound very, very busy AND happy! I play scrabble (against the computer) or Tetrus. Most relazxng for me is listening to radio programs (we don’t do TV) and crochetng. I often have stacks of hats or scarfes or shawls in my spare room. I love doing puzzles and I love doing Charles Wysocki puzzles as well, they are my favorite. I have lots of them. Viki, since we don’t have seasons down here in San Antonio, I have divided up all of my puzzles (most of them Charles Wysockis) into four groups. The one I have on this entry is in my autumn pile, which I can’t wait to start making. Have you puzzlers heard of Will Moses? He’s a folk artist here in the Hudson Valley, NY – Mt. Nebo Gallery, and a number of his fabulous art has been made into puzzles. If you like Charles Wysoki, I think you’ll like Will. Thanks for this tip – I love those Halloween and Christmas cards. Will be buying some for sure! I checked out Will Moses that is awesome they are right along the same line as Wysocki. Actually keep a table set up with one going all the time…. I, also, belong to several puzzle groups on Facebook that are quite entertaining. I recently adopted two kittens and their antics keep the place hopping! My reading is done at night in the bed when all is quiet!!! Cathy, my “puzzle table” has one going all of the time, too. And, yes, I can imagine that puzzles and kittens would be difficult to have at the same time. I can just picture them batting the pieces off your puzzle table! You also blog, Danna – or are we not fun? *Puts innocent expression on her face and hides big stirring spoon behind her back* Lol! Susan*, there you go! That definitely is something I do! Plus, I already spend way too much time online! If I am not reading I am quilting. we used to be avid Puzzlers also, doing all Charles Wysocki our favorite we have a couple of his prints that signed and numbered, absolutely love his work. If I am not doing any of the above then I am cooking! Annette, wow! Signed and numbered Charles Wysocki prints! How lovely! I embroider – mostly counted cross stitch, but other forms as well. When I’m not reading, or embroidering, I am researching my family. I am surprised by how much time that takes every day. I dance. A lot. I belong to several groups and am the leader of 2 of them. I volunteer teaching folk dance. I also have a therapy dog. We volunteer in schools through the R.E.A.D program. Spend time with sweet children and grandchildren. Life is full, busy and happy. I like to walk, hike, cross stitch, knit, do puzzles, and participate in car shows. Kathleen, I hope you have read A Murderous Yarn by Monica Ferris. Not only do you have the needlecrafting theme, but also, it involves a car show/race! Evidently the adult coloring books aren’t available in this area yet. I have asked at WalMart And at Krogers and neither of these stores have them yet . maybe by Christmas!!?? I have done quite a bit of reading this past summer but otherwise I like to crochet. I also like to go play cards at the Senior Citizen Center. I have made quite a few friends at the center. I also joined a group at my church that has a handy craft gathering once a week. We have people from various religions that meet . Some people knit, some like me crotchet, some make jewelry, some just sit and listen. Our priest joins us and we can ask questions we have about the past Sundays gospel lessons or any thing else that we want to discuss. This week I wanted to discuss the Book of “Ecclesiastes.” We had a very interesting discussion!! I am Roman Catholic but the church I attend is an Episcopal church. We have quite a group. And!! We all get along just fine Thank you!!! It sounds like your Senior Citizen’s Center is a great place to meet others with the same interests. Yes! We are having family over for dinner tonight so I have to move my puzzle off. I do them on a board. Can’t bear to be without, so in addition to the book stash I have a puzzle stash. Love the Charles Wysocki cat puzzles. Emma, I bought Charles Wysocki’s Frederick, the Literate the last time I was at Target. Some of Wysocki’s other cat puzzles (like Remington, the Horticulturist and All Burned Out) look particularly difficult. Danna, even tho I’ve never bought or worked a puzzle over 500 pieces, when I saw the cat among the books jigsaw a few weeks ago I knew I ‘had to have it’. Aren’t the book titles the cutest? Haven’t worked it yet. I agree the other cat puzzles looked difficult. I’m so glad you introduced me to Charles Wysocki as I’ve enjoyed working the 300 piece jigsaws. Danna, our family loves putting together puzzles at Christmas time. My year-round relaxation hobby is sketching and painting with watercolor pencils. I think the adult coloring books are an excellent idea too. Sometimes I draw from nature pictures I’ve taken or from things on Pinterest. Wendy, we do family puzzles at Christmas time, too! My daughter and I were the only active participants last year, but every once in a while my son and husband would stop by the table and look for a piece or two. I like the puzzles in our daily paper – there’s the usual crossword and a ‘New York’ crossword (I like the other one best) The one which is my favorite is famous sayings by famous people and usually will give me a laugh too. A recent one was by Lucille Ball and brought back memories of her and ‘Rickie’ and the troubles Lucy and Ethel always got into. LOL. Jackie, yikes! All of you who do the New York Times crossword puzzles put me to shame! My mother in law used to do them, and when she would ask for help, I was never any good at making all of the different connections that are needed to do them. I just started coloring too. I found a butterfly color book and love it. Ever since my mom passed away I found a butterfly twirler in her house when we cleaned it out and it has hung by my window. Every year I have had 3 butterflies come. (one for my grandma, baby we lost and my mom is my theory) Now that my grandpa has passed and we moved, our back field is full of butterflies all the time. Fishmom23, what a beautiful story about your butterfly companions! I love your theory! We do jigsaw puzzles on our formal dining room table too. I find it very Zen especially during marathon phone calls with my 82 year old Mom :). My husband enjoys doing them with me also. Right now we are doing Mt. Rushmore by Eric Dowdle. If you like Wysocki,you will enjoy Dowdle folk art puzzles. I am a hand quilter also and I stitch at night while we watch the cozy mysteries on Acorn TV. Speaking of Eric Dowdle, I looked him up a while ago and found that he has puzzles for all three locations that are dear to me right now. We live in San Antonio, our daughter lived in New Orleans, and she just moved to Washington, D.C. puzzle. I’m surprised at the number of cozy readers that do puzzles. I always have a puzzle on the go. I’m also a gardener, and a knitter and quilter. I always carry a cozy mystery in my handbag for any time I have to wait. Now if I can figure out how to read and knit at the same time I will be heaven. “I’m surprised at the number of cozy readers that do puzzles.” I don’t think it’s too surprising, Colleen. After all, cozies are puzzles too. They’re just a little less ‘hands-on’ than jigsaws or crosswords. Colleen, there do seem to be a lot of us who enjoy puzzles. Also, there are quite a few gardeners and knitters/needlecrafters here as well. I used to drive my children to/from school. Whenever I waited for them to get out, I would listen to my books on tape and cross stitch. So there you go! Audio books may be in your future! When I’m not reading I’m quilting, doodling (Zentangle), making cards, scrapbooking and my newest addiction art journals. Back to reading not always cozy but most of the authors are from your site. Thank you for introducing me to soooo many wonderful authors! Leap Year Baby, I’m glad you’ve been able to find some wonderful authors to read, but after seeing the other things you do for fun, I’m surprised you have any time left over to read! I love doing jigsaw puzzles but space is an issue. Then discovered puzzles on the iPad. You can choose as few or as many pieces as you like and re-do them over again. Otherwise I knit and using an e-reader I can do both at the same time if the knit pattern is in a simple section. Elizabeth, there are a few people who do their puzzles online. I would think it would be difficult. I need the puzzle piece in my hand, while I search (sometimes) aimlessly for where it goes. Kudos to you on being able to knit and do a puzzle at the same time! When not reading cozies, I am blessed to share my life with my wonderful husband, four rescue dogs and two rescue kitties. I enjoy watching ‘old’ Law and Order: SVU (and completely miss Stabler in the ‘new’ episodes!!!) or I Love Lucy – okay, I guess that’s just my early morning wake up time before getting ready for work! I did scrapbook for several years but sort of lost the passion for it after walking my mom home in her battle against pancretic cancer. I love just being with my husband and our fur kids taking walks or playing with them; spending time with my siblings, my niece and her three children and my circle of friends. I love photography – especially old churches, schools, buildings; journaling; studying Sacred Scripture; reading about the lives of the Saints; or spending quiet time listening for God’s voice in the silence. I sound really simple but I absolutely LOVE my life and those who are a part of it! Janice M, I’m sorry for your loss. I’m glad you have a happy and full life. It sounds like you are very busy.